In my last post I shared with you that I was working on a pair of socks for a friend. This lovely lady has a problem buying socks because she has extremely large ankles in comparison to her foot size, along with the fact that one ankle is 2 inches larger than the other. What to do? Hummmmm????? First off, I couldn’t use my customary ” left/right toe cap” in the “More Toes” tutorial (click my “Tips and Tutorials” page) because of the large amount of increases I would need to accomodate the ankle measurement, so to solve that problem I opted for my “Slipper Toe Cap” pattern instead, using the width of the three middle toes for my provisional cast on ( see “Tips and Tutorials page). 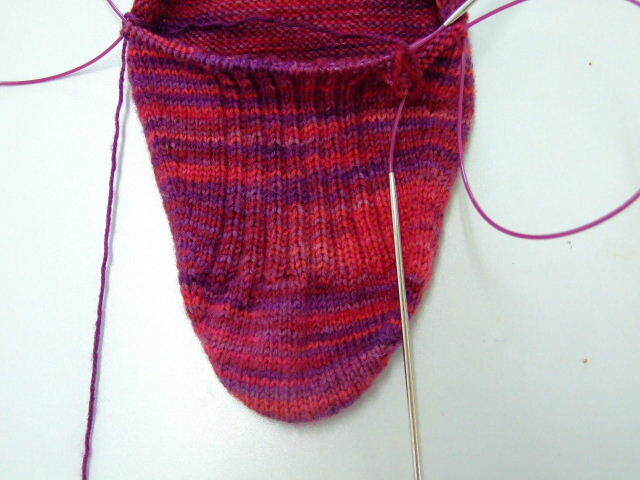 When my toe cap was completed I began increasing equally on each side till the entire toe area was complete. 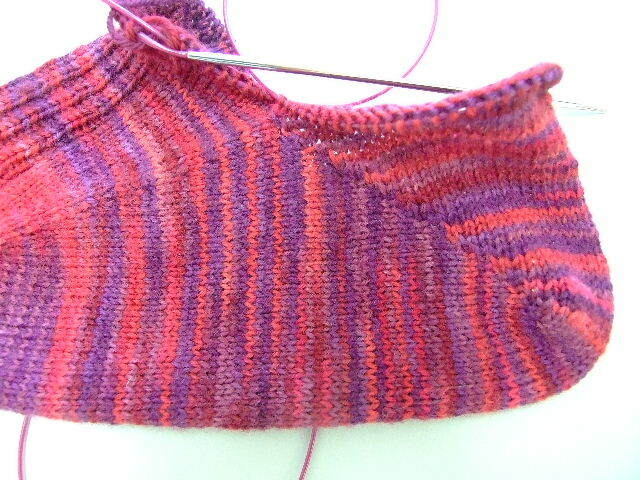 With the toe section finished, I began a 2 x2 rib on the upper center instep section. The increases from that point on were made every fourth round, one stitch in from the beginning and ending of each side of my Magic Loop NA (needle A, first half of round) and NB (needle B, last half of round). My ultimate goal for a total stitch count was 1 inch less than the circumference measurement of the ankle. My next task was to form a relatively narrow heel, while retaining the large number of stitches I needed for the ankle. To do this, I planned a 3 inch deep heel. Using half of the total stitches, in my case (52), I began my heel by working 18 sets of short rows, leaving 16 stitches, ( or 2 inches) in the center at the turn. Here is the result. You can see the wide ankle stitches are in their proper place, evenly distributed to fit this special foot. * Just a note on the placement of the heel. Even though her foot measured 10 inches from tip of big toe to back edge of heel, I finally got the proper fit when I planned the turn of the 3 inch heel at 8 1/2 inches from the tip of the big toe, otherwise it did not fit the heel as smoothly as I wanted it to fit. If you will take a good look at a commercial sock, you will notice that the heel turn is NOT at the back edge of the heel, but forward of it. Now, all I have left is a few more rounds, working stockinette only on the heel portion, then I will complete the sock with the 2×2 rib around the entire sock for about 5 inches. The right foot will begin as for the left foot, except that the increases on the instep with be less, and will be spaced every 6th round. The 3 inch heel construction will still be needed so I will have to borrow a few stitches from the instep in order to work the 18 short row sets for the heel, but that’s OK, it will fit, and that’s what is important. Hope this helps those of you who might have these special feet. While working on a pattern for a Tabi Sock Pattern, I began to think about all the different foot shapes, heel shapes and variables there are in making a custom fitted sock. I was especially thinking of those I know that have difficulty in finding socks that fit them. Some just have unusual foot shapes, while others have had to deal with medical issues. The bottom line is that they should have socks that fit them, too. So where do they go – hummmmmm?????? Who can make socks to fit them????? Well, to me it is a challenge, one that is definitely worthy of my time and effort. So to that end I have put together a short illustrated tutorial to give you some ideas you might consider in designing your own custom socks, or perhaps designing some for that friend who can’t seem to find the “right” fit. This offering is one that will be updated as I deal with different issues, but for now it covers the basics. 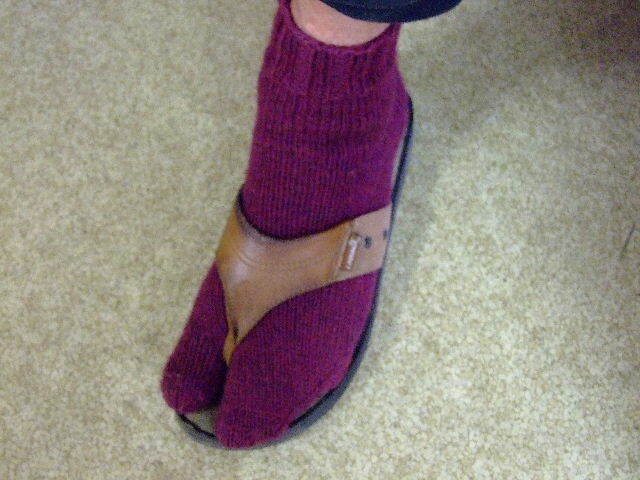 Below is a picture of the Toe-Up Tabi Socks my brother and I designed when I was in California. His foot is a bit unusual as he has a second toe that extends way beyond the big toe. He also has a very narrow heel and ankle. You will also notice that his toes set at an extreme angle, and the base of the little toe is well below the base of the big toe.